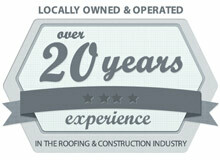 With over 20 years of experience in the roofing and construction industry. Locally owned and operated. For your protection we are licensed, bonded and fully insured and guarantee all our work for 5 years to reassure our customer’s satisfaction. Our installers are employees not subcontractors. We offer references upon request. Call or email us today for additional information. Insurance claims are accepted. Be sure to mention you saw us online.